Good times!! great action on the mackral with a couple nice wahoo too. Goos job today on the wiring and gaffing guys! Today we had a father son team of cattle farmers from the Midwest, these guys made short work of a limit of dolphin,king macks and wahoo! Pretty work! We had good dolphin action this morning and then went looking for a blue one or a tuna only to come up with one more nice dolphin. Thanks for a great day guys see you next June! Mahi were biting good today most boat did well on them along with a few tuna and marlin. We landed a nice blue marlin today along with a couple yellowfin, the sharks are still a problem eating most of our catch right off the hook! Our crew did a great job landing a 210 pound big eye today! We also lost another big eye battled a huge shark hooked in the dorsal for close to two hours hoping for something better and landed nice yellowfin! Great day guys! Today was rough on us the sharks killed us eating two thirds of our catch! That's fishing though our crew did a great job battling sharks for what they caught! The highlight of our day today was a nice blue marlin landed by a young lady! Great going guys ob a pretty fish! Great day today guys! Fishing was tough the sharks were eating half of what we hooked breaking lines eating spreader bars and the boats were all battling for position to get a bite. We managed to get for yellowfin to the boat and a nice big eye. We had great fishing today starting out with a nice big eye only to loose it. That was ok though our two anglers came through landing a great catch of nice yellowfin. Great job guys! Blue marlin on the line today! Our crew did a great job landing a nice marlin along with some nice tuna.The sharks are still a problem attacking our tuna daily. Today we had a nice catch of big tuna. The sharks were trying to have their way with us but we managed to get a few away from them. There were also some good dolphin catches down south and a few wahoo and marlin. We had an epic day battling giant big eyes most of the day today. 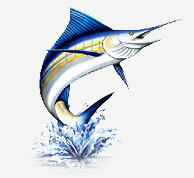 Our anglers did a great job landing a 121# 172# and a 183# trophy fish today along with mahi and yellowfin tuna. There were also quite a few blue marlin caught today in the fleet. Great going guys on an awsome day!